The sizing chart for Fruit of the Loom is provided by the manufacturer. The sizing chart is intended for your use as an approximate gauge for your body shape and size. 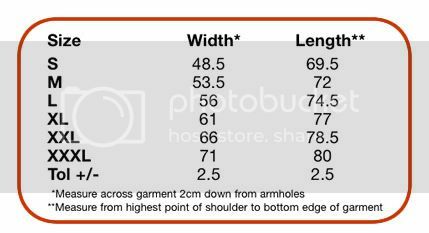 Clothes can fit your body shape differently, so please use the size chart above as a rule of thumb. Only you can determine the comfortableness of the clothing based on how loose or tight you prefer your clothing.